SpaceX's next big resupply flight to the International Space Station is scheduled for March 16. ISS managers approved the launch date this week, which will liftoff from Cape Canaveral's Complex 40 launch pad. The time? Precisely 4:41 a.m. EDT, exactly when the Earth's rotation brings the ISS flight path over the Space Coast. SpaceX, a passion project of Tesla's Elon Musk, previously shuttled supplies to the ISS last year. The mission is part of a $1.6 billion contract with NASA, which calls for 12 missions through 2016. Like SpaceX's two earlier flights, the agency's Falcon 9 rocket will shuttle its Dragon cargo carrier up into space, and chase the space station for two days before making a final approach on March 18 using high-tech laser mapping sensors for guidance. Once Dragon, which will be filled with food and experiment supplies, is in range, the ISS will use a robot arm to grapple the capsule and dock it in a Harmony module. 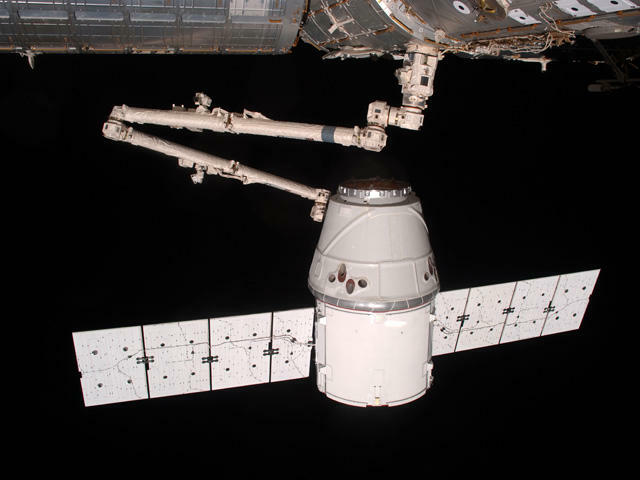 Dragon is expected to stay docked to the ISS for an entire month, giving astronauts plenty of time to unpack the capsule's pressurized cabin, said to be about the size of a walk-in closet. Once everything is unloaded, the crew will then reload the spacecraft with cargo, including biological samples and equipment needing repair. In addition, the ISS is expected to robotically remove some payload stowed inside the Dragon's unpressurized trunk.